​As you look around this church, remember that it has been the centre of worship over many centuries for the Christian community in the area. Succeeding generations have added to or changed its structure, and the clues to these stages are to be found in architectural details, historical records and the framed floor plan on the Norman pillar by the font. Why Goodworth Clatford? The original Saxon pagan settlement by the river was known as ‘Goda's enclosure' and it was to this settlement that missionary nuns came from nearby Wherwell Priory. Eventually a small Christian community formed, probably worshipping in a wattle and daub building of nave and chancel. 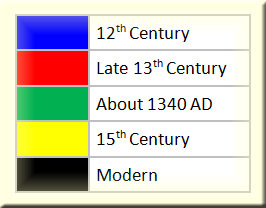 In the Domesday Survey of 1086, the first great statistical document of modern Europe, the area is known as Godorde and recorded as held by Wherwell Priory: ‘Warwelle, the same abbey, holds Godorde and always held it' - which implies a settlement of some longevity. At the same time Godorde became Goodworth and the first register indicates the final change: ‘This is the Register Boke of Goodworth Clatford of all Christens, Weddings and Burials from the year of our Lord God 1538'. All registers except those in current use are now held in the Record Office in Winchester. As Wherwell Priory had a central relationship to this church up until 1959, its history is relevant. Founded by Queen Elfrida, wife of Edgar, around 986, it was one of the largest mediaeval religious houses for women in England, and held the patronage of St. Peter's until the dissolution of the monasteries by Henry VIII. Thereafter the advowson was held by the Lords of the Manor at Wherwell, and was only transferred in 1959 to the Bishop of Winchester by William Iremonger when the United Benefice of Upper Clatford with Goodworth Clatford came into being. The church from which the present structure has grown began as a small nave and chancel to which a South aisle was added towards the end of the 12th century. Around 1190 the chancel space was thrown into the nave, transepts being added on either side and a new chancel built. The 14th century saw more building with the addition of the North aisle and the rebuilding of the tower, replacing an earlier one. Many stones with 12th century ornament can be found worked into it. Both aisles were rebuilt in the 15th century, the South being made equal in width to the transept. Over the years the usual necessary repairs have taken place. The shape of the spire was changed from square to octagonal in 1860 and it was shingle covered. When the chancel was stripped in 1979, a ‘workman's doodle' in the form of a miniature carving was found, and is now in the window reveal behind the vicar's desk. 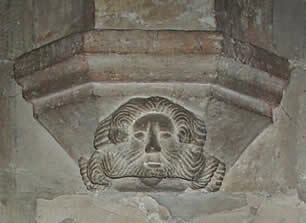 While the church possesses no ancient monuments or gravestones, various details remind the visitor of past centuries. ​The South arcade has early Norman rounded pillars on square plinths with leaf spurs at the angles and trumpet scallopped capitals. 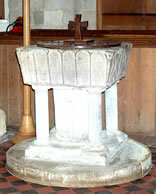 ​The nearby font is also Norman, of a table type in Purbeck marble. 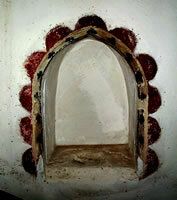 It has six flat arches on one side, motifs on the others and has been restored. ​The pointed arches in the West bays of the South aisle are identified as of 1190 and the third one has dog-tooth carving. The chancel arch is late 12th century and matches the transept arches. In the North aisles the rounded pillars have octagonal bases and decorated capitals, with carvings of a man and woman on one, set in foliage at the angles. On the rear West wall a similar carving of a bearded man can be seen. The North aisle opens into the organ chamber by the rear arch of a 15th century East window. On each side of it are two moulded brackets of 15th century dating. The higher pair probably carried the timbers of an extension of the rood loft across the aisle. ​Ancient and modern history are linked in the Brother Douglas Chapel in the South aisle. A small piscina with a shallow round basin can be found in the South wall. The chapel itself was dedicated in 1963 in memory of Brother Douglas Downes, co-founder of the Society of St. Francis, which in 1934 bought the vicarage opposite the church and used it as a home for ‘Wayfarers' and destitute men, filling a need in those pre-war years. That need disappeared with the demand for man-power in the 1939-45 war and the buildings were demolished. Continuity is the theme of this church and as you walk around you will notice the windows commemorating many members of the Iremonger family connected with St. Peter's by a succession of incumbents and the holding of the patronage. The list of incumbents, beginning in 1 321, can be found on the South wall. A great feature of village life in Goodworth Clatford is the sound of bells summoning people to this church. The eight bells in the tower are regularly rung and their framed details are on the south wall to the left of the porch door. The oldest bell No.6 was cast by John Wallis in 1622 and is inscribed ‘Give Thankes to God', whilst No.7 cast by John Danton in 1627 is inscribed ‘Love God'. Two light weight bells were added to the existing six in 1986, the No.2 being recast from a bell given by The Royal Air Force Guild of Bellringers. The Treble, inscribed ‘Holiness Unto The Lord', was paid for from monies collected in and around the parish, adding to a bell fund started in memory of Ernest Dowling, a past churchwarden whose name was commemorated on No.4 in 1937; this continues the long links of the Dowling family with this church and reminds us that St. Peter's has been, and still is, central to the life of its community. Before you leave we invite you to ask for God's blessing on all who minister and worship her. Grateful thanks are expressed to Helen Burroughs for researching, compiling and writing the above.